The picturesque town of Kanchanaburi in central Thailand is a young town by Thai standards considering it was only discovered in the early 19th century. 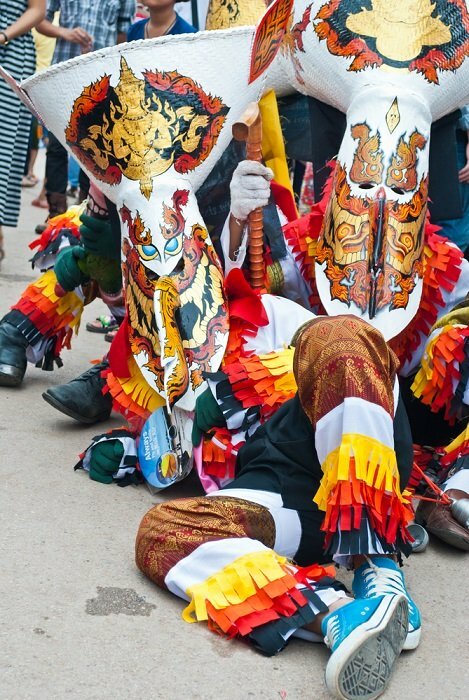 It is situated 130 kilometres (80 miles) to the north-west of Bangkok on a highway leading up to the Burmese border and congregates at a junction of two rivers. One is known as Khwae Noi and the other is called Khwae Yai which eventually joins to form the Mae Khlong river. The surrounding countryside is covered in a vast expanse of limestone hills, sugar cane fields and such sheer scenic beauty. Tourists coming to Thailand know that Kanchanaburi is mostly associated with being the site of the infamous Thai-Burma railway which began its notorious journey from here. The Bridge over the River Kwai that we see today, is in fact not the original bridge built by Allied and Asian slave labour during the second world war. Now I know many a visitor to Thailand misses out on going north of Bangkok but I assure you that there are some spectacular places to see when travelling further afield. And in this case Kanchanaburi in central Thailand. It could very well be because sometimes showing the atrocities of what happened here during the second world war may not be on everybody's hit list. However, it's still a great place to explore and visiting some of the sites here are still worth seeing it with your own eyes. 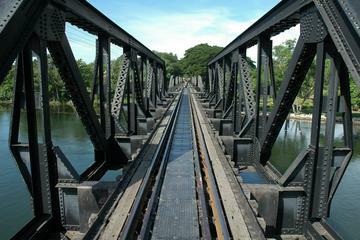 Kanchanaburi is one of those places where many remnants remain visible today. The link you see above is a full day sightseeing tour of what made the River Kwai so famous worldwide. Booking your tour here (at no extra cost) you'd not only give me a little pocket money but you'd be helping me maintain this blog so that I can continue giving you more Thailand travel information. The first bridge, further north over the river, was built of wood but today no longer exists. It was built between 1942 and 1943 as a much-needed supply route for Japan to get their vital equipment and troops across Thailand into Burma for an eventual attack on India. The sea route to India, at the time, was monopolised by American warships making Japanese supply ships subject to increased attacks. They had to find an alternative safe passage and this seemed to be the perfect plan. The length of the railroad was in total, 415 kilometres (260 miles) which took just eighteen months to fully complete. Originally a 5-year plan had been allocated for its construction, but the Japanese needed to finish earlier and this caused some concern. Come to think of it, far too many lives were lost considering the Japanese ended up losing the war anyway. A real waste of human life and suffering. During this period, Thailand was not at war with Japan but consented to the construction. Not the best career move. The wooden bridge was eventually abandoned in 1943 for an iron bridge which in turn, was later bombed repeatedly by the American air force in 1944. You will also notice segments on the iron bridge differ from one another. The two angular sections seen in the photo at the top of the page were replaced after the war. The attention surrounding the events inspired a novel and finally a film which I recalled watching some years ago. What the Hollywood movie portrayed, though, and what actually happened here, tell a vastly different story. Nevertheless, it brought back an awareness of the atrocities which once occurred on this site. When I was still a kid, I remember reading many books about the second world war and was often fascinated by it, but the movies seem to have brought a certain reality to it. Venture a further 80 kilometres (50 miles) beyond Kanchanaburi on highway 323 and you will have reached the infamous Hellfire Pass (Konyu Cutting) or as it is called in Thai, Chong Khao Khat. It bears silent witness to the enormity of the inhuman brutality that Allied and Asian prisoners of war must have endured whilst having to carve out solid rock from the surrounding mountainside. The gruelling task became 12 weeks of sheer hell. 700 Australian, Dutch, British and Asian prisoners lost their lives working with an assortment of tools such as hammers, shovels, picks, steel tap drills as well as dynamite. On close inspection, you can see the marks where the drill and blast holes were made. Other prisoners died later of malaria, dysentery and cholera. 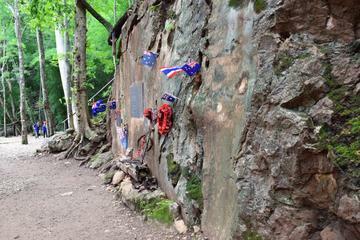 The pass is now a memorial site managed by the Australian government. If you are up to it, spend some time on this nostalgic trip to commemorate those fallen heroes. Hellfire Pass Memorial Museum is situated 250 metres from the pass, where an exhibiting of artefacts, implements, photos and a video documentary depicting the true events as to what really happened on during the construction the Thai-Burma Railway. There is also a memorial walking trail for those of you who have more time. Surely not for the faint-hearted. If you know anything about Hellfire Pass and the Memorial Museum, give me a high five. I have been here twice not only because of my interest in Thailand but because of my interest in what happened here during the war that so tragically took so many young lives. Why grown men want to go to war baffles me. Anyway just for the record, the Memorial Museum was built by Australia and the Royal Thai Armed Forces largely because so many of the men that perished here were Australian. My heart went out to these brave guys and I've seen a few sad places. The Development Command exhibition area here shows the life and death of prisoners of war, the construction of the track, tools, paintings, drawings, a short film about the construction of the line as well as personal items of prisoners such as letters and clothing. There are two paths that lead from the museum to Hellfire Pass. One is a concrete path and the other is a bamboo path. It is highly recommended that you take the bamboo path which the POW's used when they went to work. The trail leads through bamboo groves and offers a top view of the entrance of the pass. For the adventurous traveler, there is also a four kilometre long hiking trail that begins at Hellfire Pass and includes several infamous parts of the track. About 170 metres after the Hellfire Pass is the River Kwai Noi, a vantage point from which you can overlook the entire valley. For more information and to see if this particular excursion is up your creek, check the details above. Should you want to get away from the crowds of the bigger cities, you could stay in one of the luxury river resorts here in Kanchanaburi. This part of Thailand has some of the best scenic spots. In fact, if you go upstream from the bridge to the wooded valleys of both rivers, you will pass through the amazing scenic countryside and view some magnificent waterfalls. Jeath War Museum derived its name from the first initial of those nationalities who were involved with the construction of the bridge, namely Japan, England, America/Australia, Thailand and Holland. There were, however, other nationalities dragged into the Japanese war efforts, namely the Koreans, Burmese, Chinese, Javanese and Malays. The total number of deaths altogether was just under one hundred thousand. The exact figure - 99,044. To get to the museum you would take a drive on Pak Phraek Road very near the entrance to Wat Chumphon. Inside the museum, you will see reconstructions of what it was like during those horrendous times. Not for the faint-hearted, but a must see. The museum is open daily from 8:30 am until 4:30 pm. Chong Kai Cemetery is just across the road from the museum and you can walk among the memorials. I found a number of my friend's ancestry there, but none of them was mine. My last name is Pike, so if you do come across my name anywhere, please let me know. Erawan National Park is located a little further north in the wooded valley of the Kwai Yai River and has a series of waterfalls which are accessible by a forest trail. Buses leave every hour from 8:00 am until 4:00 pm at Kanchanaburi for the hour and a half journey there. Sawan Bundarn Cave is located close to the central western town of Sangkhlaburi on the northern shore of Vajiralongkorn Lake, formally know as Lake Khao Laem on the border with Burma. To get to the cave you would take the main highway 323 north-west of Kanchanaburi. 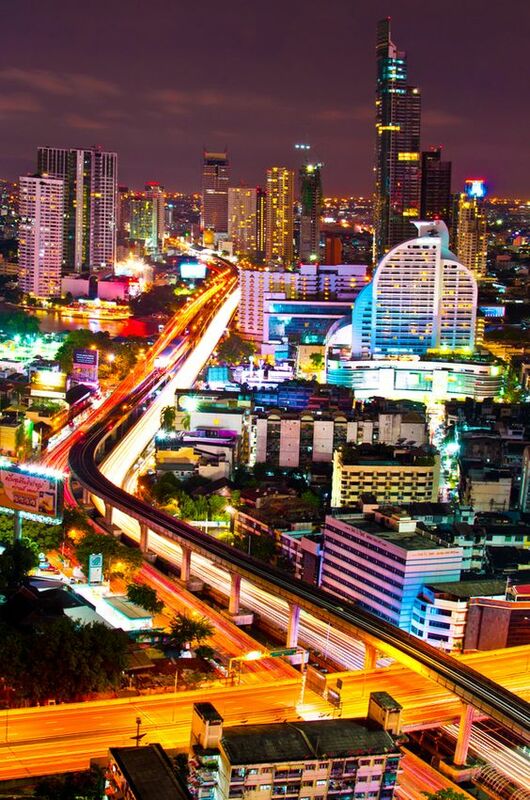 I am not sure how far it is from Kanchanaburi but from Bangkok it is 340 kilometres (210 miles). Along the way, you will be able to stop and view the Erawan Waterfalls. This cave is on the way to the Three Pagoda Pass, which is named after the three small pagodas which you'll see when you get there. The journey is approximately 20 kilometres (13 miles) from Sangkhlaburi. The cave is maintained by some friendly monks and there is no entrance fee. You will come up close and personal with some very small bats. So small in fact that some of them are about the size of a bumblebee. See if you can spot any!